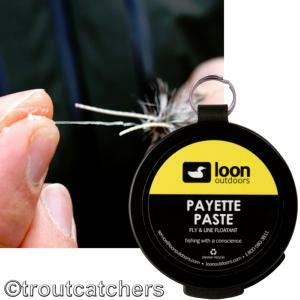 Loon Payette Paste a Fly & Line Floatant. Who doesn't love options? When a spray, powder or gel just won't cut it, Loon Payette Paste comes to the rescue. The paste has a thicker consistency stays put on leader, tippet, indicators and flies. When applied, it gives hackles and leaders a silky-smooth, water-resistant coating. Softens when warm but won't run or leak. Contains human odour masking pheromones. Loon Outdoors is a USA company who create environmentally friendly fly fishing products that perform at an exceptional level.